Zack Hample is a sportswriter and a baseball collector. The 35-year old has also caught 6,819 balls at 50 different Major League ballparks across the country since 1990. But his latest claim to fame is something else entirely. Hample successfully caught a baseball dropped from a helicopter hovering 1,050 feet overhead. The Guilford College graduate completed a stunt he first attempted in July 2012 this past weekend at LeLacheur Park, home of the Red Sox Single-A affiliate Lowell Spinners. Last year, Hample actually broke Gabby Hartnett's record. The Hall of Fame catcher retrieved a ball from an estimated 800 feet in 1930 (Hartnett's attempt was allegedly dropped from a blimp - so an accurate altitude reading is difficult to come by.) Hample actually caught balls dropped from a helicopter at 312 feet, 562 feet and 822 feet. A new record! But the Federal Aviation Administration cut the stunt short due to high winds. Hample bested his mark Saturday though. Donning protective gear and looking skyward, the author of three books waited patiently in the outfield while the ball made its 12-second descent reaching a speed of 95 MPH. Following the achievement, Hample confessed to fearing for his life. "If I were to just miss it and it hit me in the face with my neck tilted back at that angle, would that snap my neck? Would it kill me? Would it paralyze me? I actually thought about these things," Hample admitted. The only problem? There was no one from the Guinness Book of World Records on hand to verify the feat - so the new mark will go unrecognized. Oakland A's slugger Yoenis Cespedes became the first winner of the Home Run Derby not to be an actual All-Star. Former Los Angeles Laker Metta World Peace agreed to a 2-year, $3.2 million deal with the New York Knicks. And Yahoo! 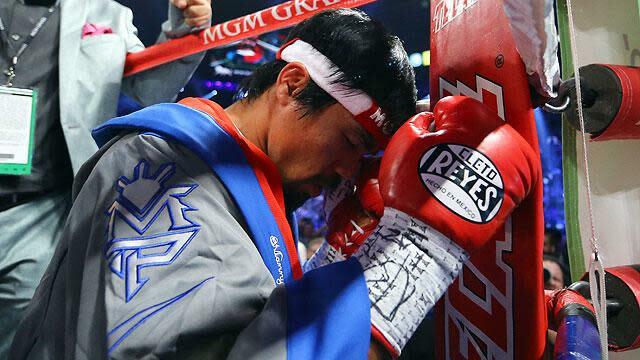 Sports' own Kevin Iole says Manny Pacquiao may never fight in the United States again. Follow @YSportsMinute on Twitter along with the Yahoo! Sports Minute Facebook page.